Interesting colorful bamboo mat and cloth napkin set. Includes four settings. Miniature dish rack in blue with dishes and flatware. Set is available in red and blue. Made for dollhouses and miniatures 1:12 scale. Miniature dish rack with dishes and flatware. 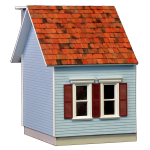 1:12 scale for dollhouses and miniatures. Available in red and blue. Miniature metal flatware with painted white handles. 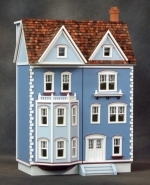 4 Settings 1:12 scale for dollhouses and miniatures. Miniature metal flatware with painted pastel handles. 4 Settings 1:12 scale for dollhouses and miniatures. Pretty miniature dinner set with 4 settings and 2 serving plates. Off-white with gold trim, 1:12 miniature dollhouse scale.